I am not usually a fan of minimal plans. My belief is that when you remove a lot from training plans, you open the body to injury and overuse. However, there are times when you need to get in, get it done, and move on. Often these times come when you have little in the way of equipment, like when on holidays or when deployed. 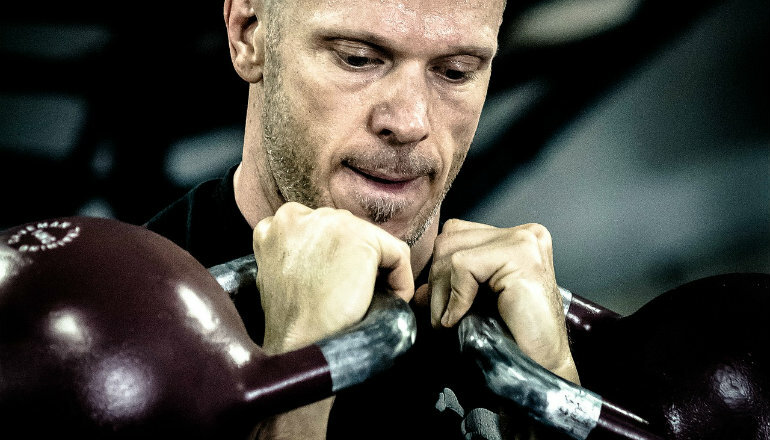 The following is a plan you can use to stay in top shape while training in a very small time frame using only two kettlebells and a pull-up bar. Oh, and don’t forget to pack your running shoes, too. The basis of this program is the famous Recon Ron pull-up program. It’s been credited many times to various people, but its real origins lie with the Marines. Note: The program begins with the requirement of being able to perform 6 pull-ups. For reference, if your chest doesn’t touch the bar, it’s not counted. All pull-ups need to be performed from a dead hang with feet off the floor. The program is pretty simple. You begin week one by performing a set of 6, then 5, 5 again, 4, and a final set of 3. Week by week, this ramps up until you are able to achieve 20 dead hang pull-ups. While the plan is great — and has worked for every single person I’ve ever told to do it — it’s not enough. You’ve got some other muscles that need attention, too. That’s why we’re going to add the double kettlebell clean and jerk and front squats. The process we’re going to follow is what I now call Recon Ron 2.0. It’s a circuit of clean and jerks, pull-ups, and front squats. Each workout follows the same set-and-rep scheme you’d usually use for the normal Recon Ron pull-up plan. Perform this workout three or four time per week. On alternate days, perform some MAF running for 20-30 minutes. Because your arms are going to be smoked by the clean and jerks and front squats, I’d suggest that unlike the normal Recon Ron plan, you are probably going to want to be able to do 8-10 pull-ups before you begin this program. Begin with a weight for clean and jerks that you can get 6-8 reps with fairly comfortably. 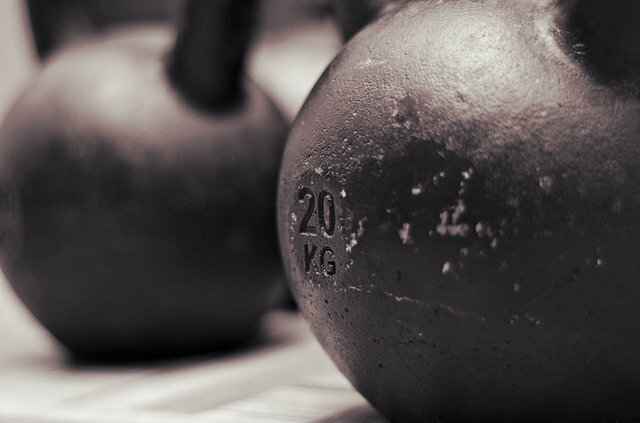 Squat with the same kettlebells you use for the clean and jerks. Rest as required during the circuit. However, because we are trying to kill as many birds as possible with the fewest stones you should try to push the pace if you can. You’ll find the descending reps allow you to keep going at a slightly faster pace than straight sets would. Warm up with some hanging and thoracic spine extension work to help you achieve a good overhead position for the clean and jerks. Some extra ankle mobility wouldn’t hurt either. If you want to be a super-stud, try either performing this program while wearing a weight vest or by including a 5km run before or after. (For genuine tough guys, do the runs in the weight vest, too). If you want to run this program longer than a month or so, I suggest that you go up in weight when you get to sets of 10. Add weight to your pull-ups and go up a kettlebell size for the squats and clean and jerks. Keep following that pattern every time you get to 10s. If you ever get to performing this routine with 32s for the clean and jerks and squats while wearing a 10kg weight vest, while also doing a 5km run after in the vest, please let me know.